Now that the raging robo-traders have tagged a double top at 2897 on the S&P 500 it is worth remembering that the booming stock market is the greatest Fake Bull in history. It is entirely a function of massive central bank liquidity injections into the financial system that have transformed Wall Street and other global trading venues into virtual gambling casinos. Indeed, in today's fraught environment it can be well and truly said that the chartmonkeys have become deaf, dumb and blind to everything happening on Planet Earth external to the gaming tables where they slosh around in their cups. After all, to use the latest evidence, what could be more indicative of a political system fixing to implode than this weekend's utterly phony and disgustingly undeserved deification of the late Senator John McCain? Folks, peek under the surface of the media hagiography. This isn't about the man's alleged heroism, virtues and service to America----because there were none of the above, as we will elbaorate tomorrow. John S. McCain III came from the loin of Leviathan (two generations of Warfare State admirals) and spent every single day of his adult life as an Imperial City payroller, peddling more war, war always and war everywhere. His stock-in-trade was regime change, boots-on-the-ground, spy-state supression of domestic liberty and hegemonic demonization of any nation (Russia, Iran, Syria, Iraq, etc) that did not bend to Washington's dictates. He was also the ultimate enabler of the Bailout State and rogue central bank money printing spree that incepted in September 2008 when McCain suspended his presidential campaign to return to Washington to address the so-called financial crisis. bailout of AIG, Morgan Stanley, Goldman Sachs and the lesser Wall Street gambling houses. So let's call a spade a spade. When Dem Congressman John Lewis, who was Martin Luther King's once-upon-a-time top lieutenant in the struggle against Jim Crow and the Vietnam War in the 1960's, tweets that McCain was a "warrior for peace" the wish to barf is understandable but not the right response. What it really tells you is that the hideously overwrought praise for McCain is just Washington code-speak; it's a respectable way to vent the rabid hatred of Trump that suffuses the length and breadth of the mainstream media and the inner circumference of the Washington beltway---save for a few GOP cowboys sent to Congress on the Donald's red state coat-tails. Given that truth, why in the world would you embrace a financial bubble that is utterly dependent upon politics and the dispensations of the fiscal and central banking branches of the state? 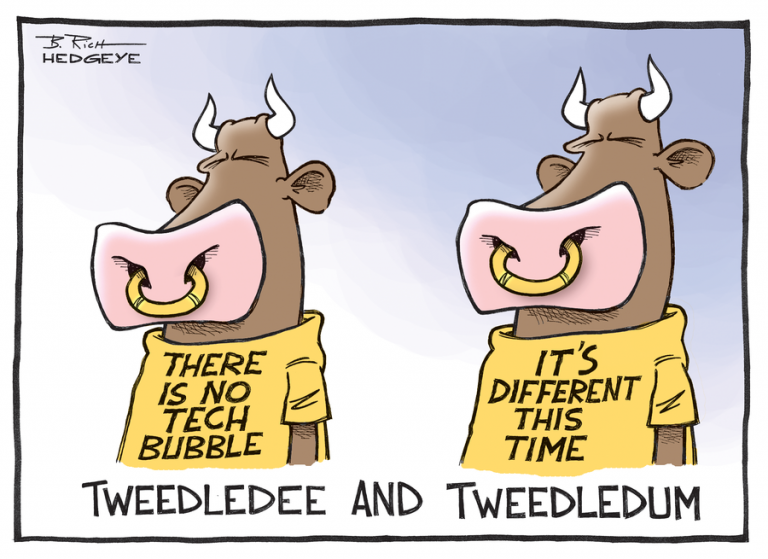 After all, there is no economic basis whatsoever for the Dow at 26,000, NASDAQ at 8,000 and the S&P 500 grasping for 2900. Those are just round numbers on the casino charts, being held aloft only by the fatuous presumption that Washington will never let the bubble burst. That is to say, unlike April 2000 or September 2008 we are putatively at the end of cycles and therefore financial history because, why? Apparently, because Donald Trump, Mitch McConnell, Nancy Pelosi, Chuckles Schumer and Jay Powell have your back! And that is not hyperbole. Not when every vestige of sound money, honest price discovery and financial discipline has been eviscerated. What's left is nothing more than the will of Washington politicians to deliver free lunch windfalls to Wall Street speculators and the 1% and 10% who own 45% and 85% of the stock market, respectively. We'll take the unders on that proposition, however, because here's the news flash that Wall Street is insouciantly ignoring. To wit, Washington is on the brink of an extraconstitutional coup aimed to forcibly remove from the Oval Office a vicious street figher and unstable megalomaniac, who is viewed by virtually one and all among the Washington political class as an illegitimate and detestable interloper. 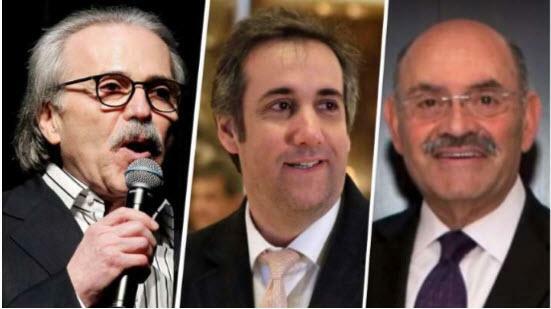 And believe us, now that the rogue gendarme of Mueller and the US Attorney for the Southern District of New York have the Donald's inner trio of scumbags by the shorthairs---Michael Cohen, David Pecker and Allen Weisselberg---there is no stopping their final push for the kill. But Donald J. Trump will not go down without bringing the house down. And by that we mean he will prosecute his Trade War on the world until the global economy buckles. He will also add fuel to the fire with his Sanctions War against any malefactors (such as Russia, Iran and any nation which trades with them) who give lip to Imperial Washington. And most destructively of all, he will cluelessly push his Deficit Finance War against America's born and unborn taxpayers until the bond pits fracture from the inflow of $2 trillion per year of government debt that either the Fed is dumping or Uncle Sam is issuing. Moreover, the Wall Street's canard that all of this Trumpian strum-und-drang is just the art-of-the-deal at work could not be more pitifully mistaken. The Donald understands virtually nothing about the $17 trillion global trading system or the nation's baked-inthe-cake $20 trillion of new debt over the next decade on top of the $21 trillion we already have. So he will push things to the breaking points, and become ever more desperate, reckless and impulsive as the Deep State, the Dems and most of the GOP's vast legion of Congressional time-servers close in on his remaining toehold on power. Just consider today's PR stunt of a "deal" with Mexico on the NAFTA trade arrangement, which no longer bears the name. As we told Neil Cavuto on Fox Business, the auto workers of Mexico will be thanking the Donald for the big raise to $16 per hour; and the Trade Nanny in Washington, and her flock of lawyers and consultants, will be more than happy to get down on their hands and knees with a magnifying glass to enforce the "deal". That is, to examine every make and model of auto coming from Mexico to insure that among its 5000 pounds of metal, glass, rubber, plastics, fibers, copper and silicon and 30,000 part numbers that exactly 45% was made with labor at $16 per hour or more, and 75% of the content by dollar amount originated in the USA or Mexico. Yes, that's a boon for the beltway trade policy apparatchiks and racketeers and for Mexican labor, but has absolutely nothing to due with MAGA. American labor embodied in auto parts and assembly ranges from $25/hour to $60/hour on a fullyloaded basis (including benefits and payroll taxes). On the margin, it still can't remotely compete with Mexico---even under the Donald's new country-of-origin and labor cost strictures. That's because, as we must keep reminding, the Fed has inflated domestic costs, prices and wages to a fare-the-well during the past 30 years when an honest monetary system would have caused their persistent deflation. Indeed, the Mexican negotiators were literally begging---"don't throw us in that briar patch, Brer Donald"! And all to solve a NAFTA problem that had nothing to do with the terms of the 1993 agreement, and everything to do with a central bank financial repression that the Donald wants to make dramatically worse. Yet when the politicians fall on each other with malice aforethought during the next two years, what kind of Economy lingers beneath the greatest ever bubble on Wall Street? The truth is, it is a beleaguered one---only thinly obfuscated by a veneer of Wall Street spin and Trumpian braggadocio. At today's S&P 500 close of 2897, the index is up 85% from the pre-crisis peak of 1562 in October 2007. Even when you strain the inflation out of the index (and ignore the benefit of @2% annual dividend payouts, too) the gain since the last peak nearly 11 years ago is 55%. Now then, what do we see on main street relative to the 55% inflation-adjusted gain in the S&P index? As we told Cavuto, what you see above all else is a 1.2% gain in the real median household income. Over 11 years! That's right, notwithstanding the alleged near-death experience of Wall Street between September 2008 and March 2009, the real value of the stock market has risen approximately 45X more than real median incomes since the pre-crisis peak. 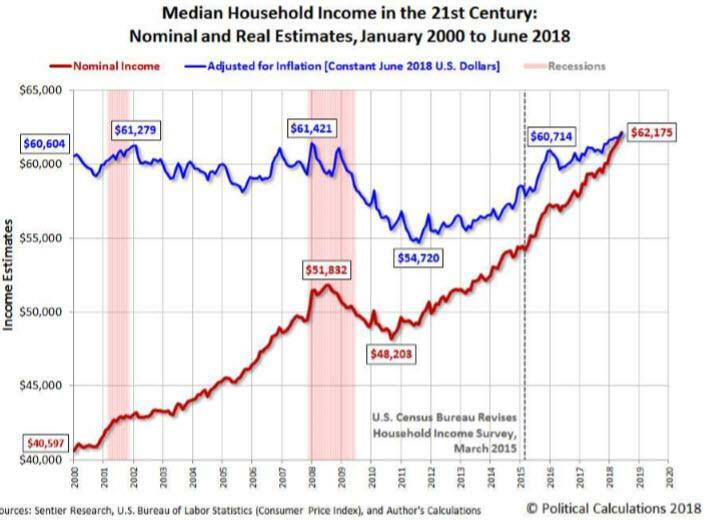 In fact, as dramatically conveyed in the blue line in the chart below, real median household income has gone exactly nowhere since the turn of the century. And there is a lot more of the same. For instance, if there are two fundamental ingredients of the main street economy, they are industrial production and labor hours deployed. The latter number strains out the flakey measurements of the U-3 unemployment rate, which ignores the 96 million adults the BLS in its wisdom deems to be not in the labor force; and the former captures the heart of GDP without all the Commerce Department's dubious imputations ($1.7 trillion of "imputed" homeowners rent on their own homes) and the bloated "output" of the health, education and social service sectors, which essentially are parasites on taxpayers and Uncle Sam's credit card, anyway. That is, these are core physical measures and are thus comparable to inflation-adjusted stock prices and household incomes. Yet industrial production(orange line) is up just 3.3% during the entire last 11 years, and total labor hours deployed from A to Z in the US business economy have expanded by merely 5.4%. Indeed, consider that at the June 2007 pre-crisis economic peak about 237 billion US labor hours were consumed at an annualized rate. Yet in Q2 2018 that number had only crept up to only 254 billion. So how do you get a 55% gain in the inflation-adjusted stock market index on just 5.4% more labor input? You don't, unless there has been a spectacular explosion of productivity, which there has most surely not been. What we are saying, of course, is that the Wall Street stock indices have vastly out-run the meager gains in the main street economy since the pre-crisis peak; and that at this late stage of the business cycle---merely 10 months from the prior record---there is absolutely no plausible risk/reward equation left. That's because earnings will plummet in the next recession---by 40% or more if history is any guide. And that's likely to be conservative in view of the elephant in the casino that Wall Street stubbornly refuses to acknowledge. To wit, back in June 2007, the S&P 500 earnings peaked at $85 per share, but that reflected fully $55 per share of after-tax interest expense. Fast forward to the LTM period ending in December 2017 when earnings per share posted at $110 per share, but reflected only $19 per share of after-tax interest expense. In other words, more than 100% of the gain over the past 11 years was due to the drastic financial repression of the central banks and its impact on corporate interest expense. Yet the central banks of the world---led belatedly by the Fed---have made an epochal pivot to QT (quantitative tightening) and interest rate normalization, even as the value of the interest expense deduction has been reduced to chump change owing to the new effective tax rate of about 15%. So interest expense is marching back up the hill, and it's not remotely priced-in---not any more than the next recession or the generational fiscal catastrophe that looms in the 2020s as 80 million baby-boomers pile onto the social security/medicare wagon. Still, consider the fact that in the June 2007 quarter, the inflation-adjusted aggregate net income of the S&P 500 companies was $240 billion, and during Q2 2018 it was $280 billion on an apples-to-apples basis (i.e., gross of the lower tax rate ). That's a 15% gain in real profits over nearly 11 years---a figure that self-evidently does not remotely warrant a 55% gain in the S&P 500 index. Stated differently, even with the new tax rate---which represents only a one-time stepchange in profits, not a permanent growth factor---aggregate net income (not per share) came in at $295 billion for the quarter ending in June. At the same time, those earnings reflected collective corporate balance sheets sporting some $7 trillion of stated debt and related liabilities. That is to say, even a 150 basis point rise in the corporate interest expense from here will cost the S&P 500 about $105 billion pre-tax, and about $90 billion after-tax per quarter! We don't think that takes a lot of figurin'. Today the S&P 500 sported a market cap of more than $24 trillion. If interest-normalized net income annualizes to $800 billion, that means the market is trading at 30X earnings---before any recession impact! As we said, there has never been a greater Fake Bull in recorded history. And there is not a snowball's chance in the hot place that Washington's impending political bloodbath can keep Wall Street's fantastic bubble aloft much longer.